The Wedgie is what I call a "Kubatool". 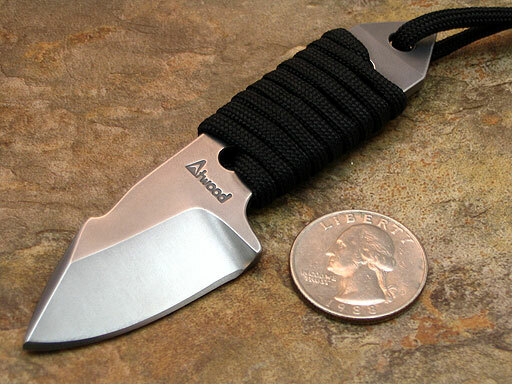 It measures 5 inches long by well over 1/4" thick and is made of the super tough CPM 3V steel. It is configurable, that is you can take the cord wrap off and make it into a koppo stick or use it bare. There are 5 evenly spaced holes drilled in the tool so you can cord wrap or tie finger loops in several different ways. The tool could go on your keyring or in your pocket and comes standard with a protective piece of tubing slipped over the end to keep it pocket friendly. 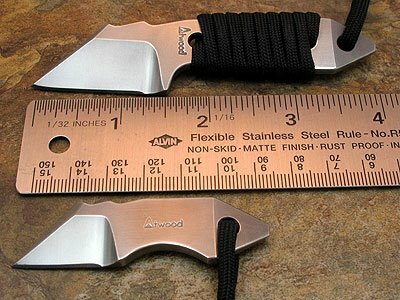 I will also be making optional kydex sheaths for them for neck or belt carry. 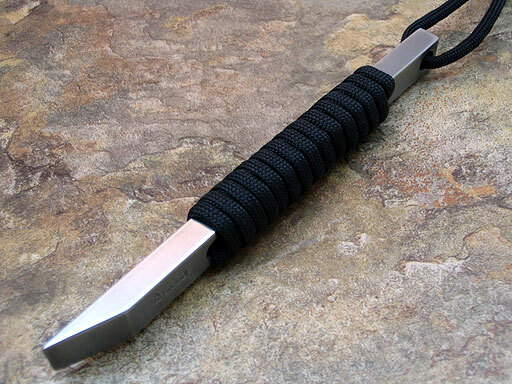 Can be used as a kubaton, a koppo stick or my personal favorite which is prytool, chisel or wedge. There have been many other kubatons on the market before but I think this one is rather unique. Definitely puts the phrase "giving a Wedgie" in a whole new light. :) Will have the first batch available in a couple of weeks. I'm having a lot of fun with these two new pieces! 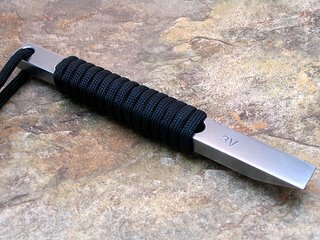 The CPM 3v Wharncliffe Scout makes for a slightly larger package but it is even more useful as a utility blade. 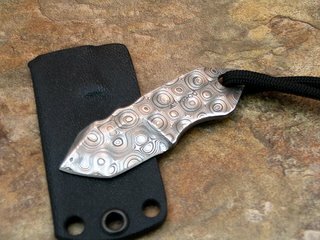 Nice EDC piece for a belt or as a low profile neck knife. 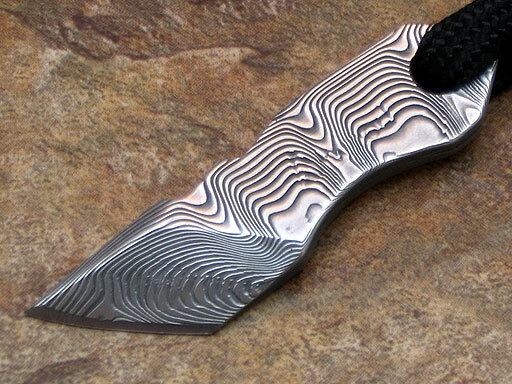 Here's something new and different, a damascus belt buckle! 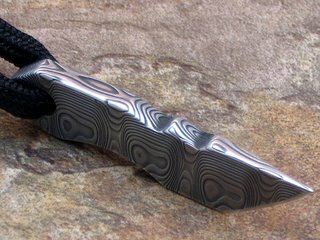 Made of Mike Norris Raindrop damascus with a nickel silver backing and exactly sized for a 1 inch wide belt. 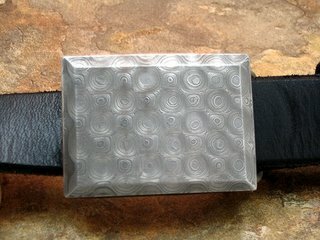 The buckle was a collaboration with my good friend John Moore who has been a jewelry and buckle maker for 25 years. His father of the same name may be familiar to some readers as the owner of Mission Knife and Tool. This is a one off piece and I'm not sure if any others will be made or not, will be extremely limited quantities if so. This was the last of a series of 3, Mike Norris Raindrop damascus. My buddy Brian has started making these cool little flat fobs. 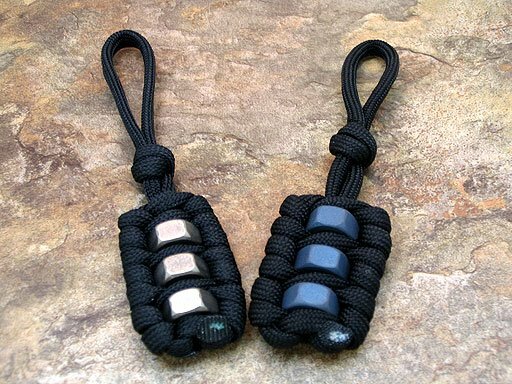 These are the latest and feature 3 titanium 1/4-20 nuts tied into them. I believe he will be offering them in plain, bead blast, or anodized finishes. The nuts make great worry beads for twiddling. :) (you can turn them) He's on vacation for another week or so but we'll be seeing lots more of this stuff coming. This was the ? piece from below. I thought it turned out quite nice from such humble beginnings. :) On it's way to a new home today. I have gotten some very cool letters over the years. Lots of fine folks have taken a moment to thank me for my tools and service. I appreciate everyone who takes time to send me a note! It really makes my day when I know that my gear has arrived safely and that the recipient is enjoying it. Anyway, thanks for all your great work, Peter!" What Is the Next Cool Thing? What would that cool new thing be? If I did come up with something how many should I make and how should I make them? How much would it cost to make them? How much time would it take me? How many steps would be involved and can any of them be eliminated? Is there a better way to make this thing? Is there a cheaper way to make it? Is there an element that would give it something extra and would that be worth considering? What if it doesn't fly, then what? How much should I charge for them? What if that price is too much? What if it is too little? Can I afford to discount them to dealers? What materials should I use? Do I have enough material in stock? If I add another thing to my lineup will I still have time to make everything else? If this thing turns out to be a big seller will I have to drop other items in my lineup just because I don't have time to make all this stuff by myself? Will I lose my mind trying to keep up with it all? What about all those things people are clamoring for? What about that batch of such and such that I promised to So and So about two months ago. If I make these now I won't have time to get to So and So's stuff. How about Dealers A, B, C, and D? I don't have a clue when I'll get time for them but I really do have to keep them happy. What about the holidays? It sure would be nice to have some of these for the holidays. But if I make these now what about all the other stuff I was thinking I will need for the holidays? Like whistles and Prybabies® and Bug Out Bars and Imps and Goblins and Micro Bug Out Blades and Micro Cards and Boogers and all those titanium versions of items? Damn it! They're too cool. I HAVE to make some.